How Much Money You Should Invest - Finance Dunia Home Loan | Car Loan | Education Loan | Life Insurance | Car Insurance Etc. How much money you should invest? Identify investment objectives: Before deciding upon how much investment you need to make, it is important to set out and define financial goals. Be it buying a house, a car, children’s education or marriage, insurances, a retirement plan or any other objective, you need to attach a figure to your goal. At the same time, you also need to decide the time taken to achieve this goal. 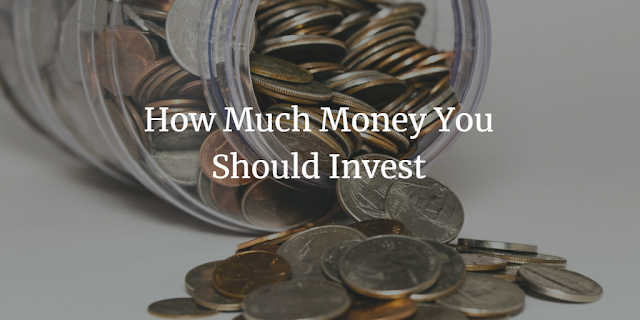 This will help you calculate how much you need to invest on a monthly or yearly basis. However, make sure this does not exceed your income at any point in time. Young investors: If you are a young investor in your twenties, then you can save and invest more. This is because you will have comparatively lower responsibilities and financial burden. You can then set aside a larger proportion of your income. A lot of experts suggest that you should invest at least 30% of your income at the start of your career. It is also expected that you have a higher ability to take risks as your financial liabilities are lower. So, typically, a major portion of your investments should be in equity-based investments. As time passes, and your risk-taking ability reduces, you can opt for more stable investments like fixed-income mutual funds and so on. Investing early: The amount you invest depends on when you start investing. This is because two factors determine how much money you end up with—the amount you invest and the time period of your investment. The earlier you invest, the more you earn. This is because you earn interest on your profits too. You thus have longer to accumulate enough money. Your overall returns increase. This may even enable you to achieve your targets early. It can best be illustrated by an example. If you set out early a target of Rs 5 crore of investments before you retire, you can spread your investments over a 40 year time span. Suppose, you expect a 12% per year return on your investments, the monthly investments required would work out to Rs 3,980 – an affordable sum. If you started 10 years later, reducing the time period to 30 years, you would need to invest Rs 14,000 per month. Taxation: Every year, the government stipulates that you can invest Rs 1.5 lakh and reduce your total taxable income. This includes investments in financial instruments like Public Provident Fund (PPF), Equity-Linked Saving Schemes (ELSS) and so on. It is almost always worthwhile to tap into this tax-saving mechanism. However, first check what your total taxable income is. If it is only Rs 50,000 over the minimum tax threshold, then why invest Rs 1.5 lakh in these instruments? You can invest Rs 1 lakh in other long-term options like mutual funds and equity portfolio. Liquidity needs: It is good to invest. But ensure you have some money left in your hands for your regular expenses. Those eager to invest often get into long-term commitments like Systematic Investment Plans (SIP). These ensure you shell out a fixed sum every month. If you fix the amount at a very high level, you won’t have any money left for your spending needs. For example, if you earn Rs 40,000 per month, it would not be wise to invest Rs 30,000 per month. Would the remaining Rs 10,000 cover all your needs? What if there is an emergency and you need liquid cash? Take these into consideration while deciding your monthly investment amount. Investing in Dream Home: Everyone wants to have a dream home of their own. However, investing a huge amount has to be planned. Majority of us invest in our dream homes post applying for a home loan. The planning requires comparison of all available options, be it a financial bank or any other NBFC. It is also important to understand how much amount you will have to shell out every month for your EMI. You can utilize home loan EMI calculators online to identify your monthly EMI. Another important step included in planning is to identify the home loan interest rates provided by financial institutions. Hope to see more frequent posts on your blog. This is a very common question among beginners and I believe one of the difficult to answer also. One can't say that how much should be enough to invest, rather how much expense you can control in your daily life so that you can save maximum could be the best way to approach investment. Thanks for sharing some great articles here. I want to invest a certain sum of money, what would you sugggest would be better way of investing, traditional methods like FD or recent and more interest paying methods like P2P? Also I'd like to know more about the P2P investment opportunities! A well written post about investment. The only thing I want to say is think before you invest. Nice post.Thanks for sharing more article.